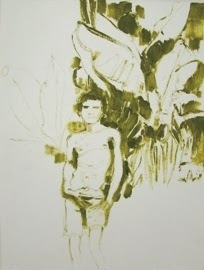 I have just gone through Vitamin P & P2 to look for painters who use drawingness or bring gestural and tighter painting together to focus the viewer on particular parts of the image. I hope that these painters will underpin the new work I make over the coming months and by keeping them in one entry, I will be able to more easily revisit these as reference material. 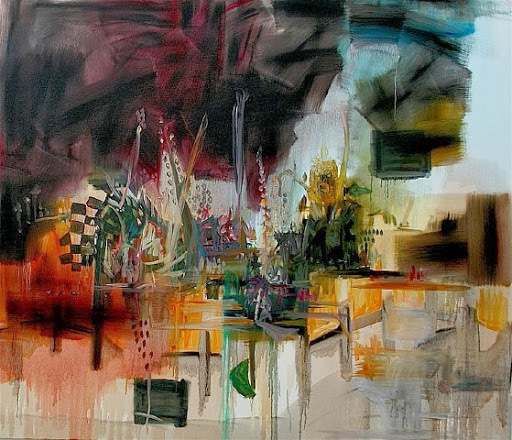 Phoebe Unwin – Mixture of more focused and loose brushstrokes. Image becomes more monochrome as it moves towards the edges. 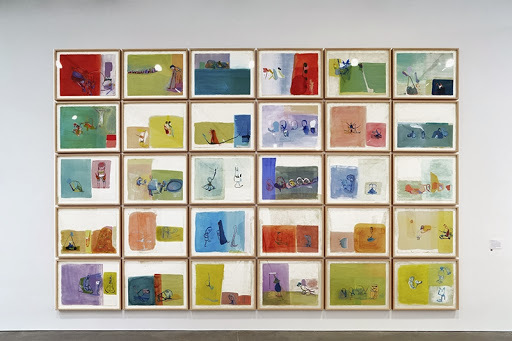 Amy Sillman – have selected smaller scale works as the block colour compositional elements are more evident. Really like the series and simplification of shapes with figures within geometric spaces. 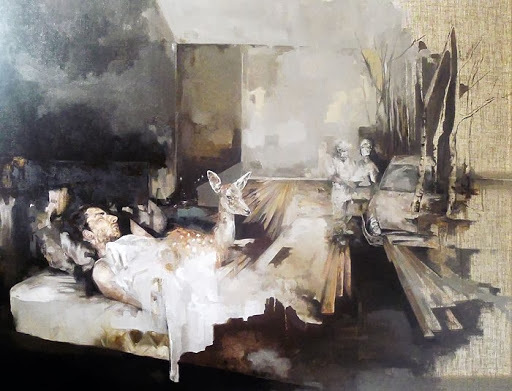 Justin Mortimer – Mortimer is my new favourite painter. Love the unfinished nature of the work, drawing and use of negative space (white and black in other pieces). 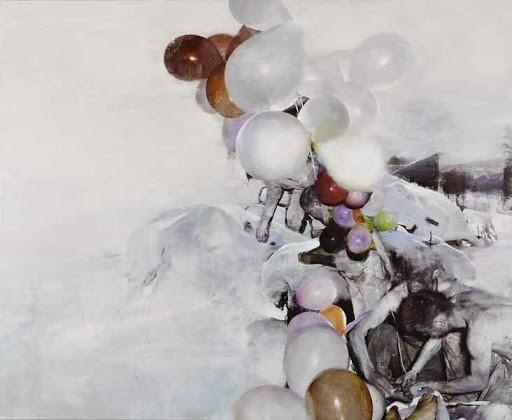 Also imbalanced compositional devices, use of diagonals and of course balloons! 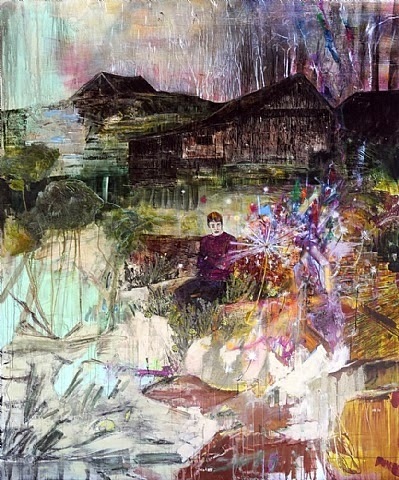 Makiko Kudo – weird downwards viewpoint and block colours, figure is absorbed by the environment. Maki Na Kamura – oily, washy surface – some layering evident but more planes of colour. Some areas of linear drawing evident against blocks and more detailed areas. 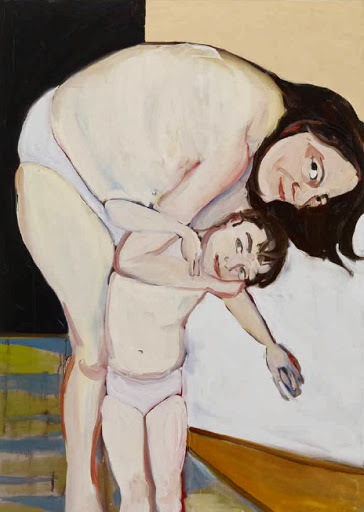 Chantal Joffe – I like the way the figure is cramped into the picture space. Simplifies lines and stripes in background suggest environment. 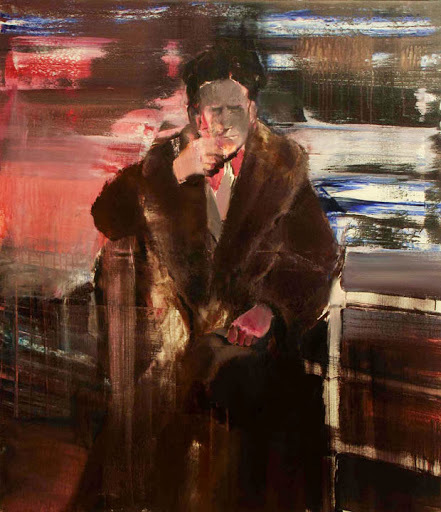 Adrian Ghenie – Virtually abstract background with more detailed figure. Tight, dark colour palette sets gloom. 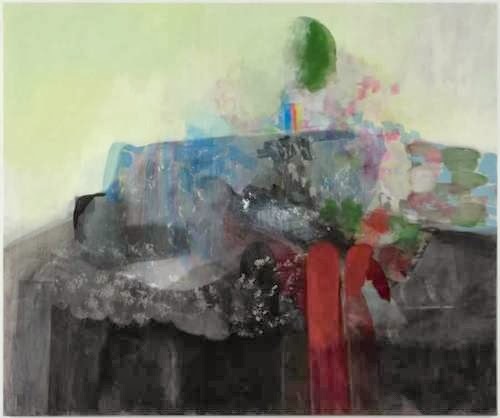 Kaye Donachie – Use of diagonals and figures emerging from the ground – environment merges through use of generic colour. 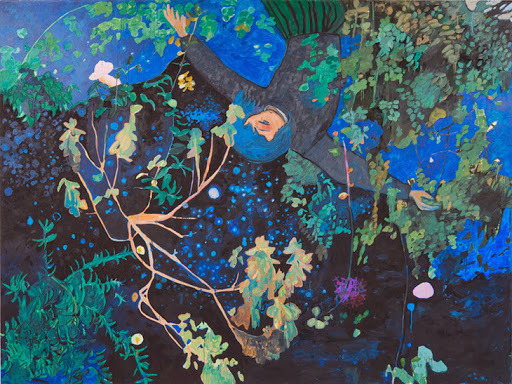 Hernan Bas – My second favourite who I seem to keep coming back to. Quite abstract gestural painting with smaller brushstrokes and sharp edges. 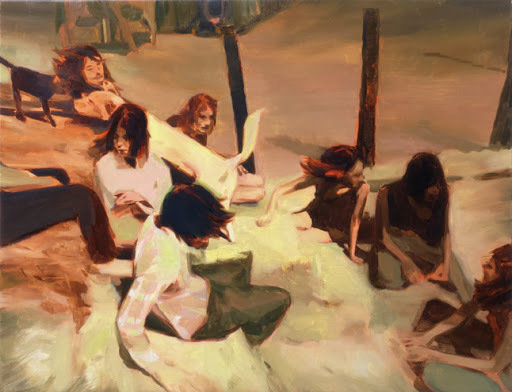 Luc Tuymans – Composition very weighted to left side. Shadow figures/suggestions on right where colour is virtually reduced to monochrome. 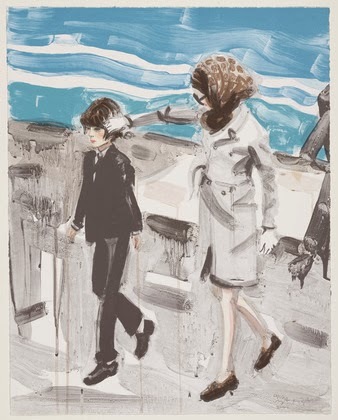 Elizabeth Peyton – Very loose brushstrokes are still descriptive. Limited colour palette creates emptiness in the painting. 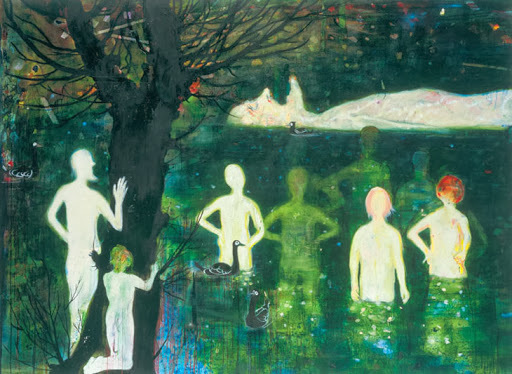 Margherita Mazelli – Distance from figure, angle of gaze and viewer. 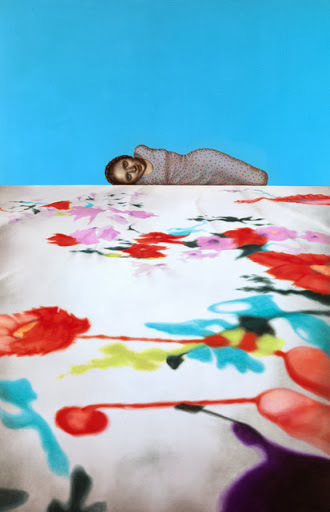 Use of block colour background against much more detailed figure and foreground. 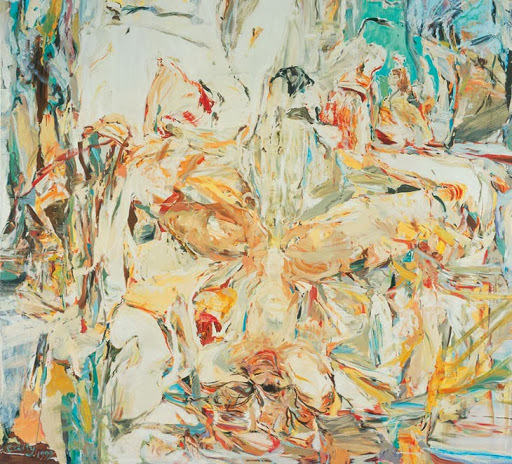 Cecily Brown – Abstract brushstrokes are suggestive. Process compliments hidden and engaging the gaze of the viewer. I am looking at more blocky paintings – thick and thin – there is less interaction between the colours in a physical way. 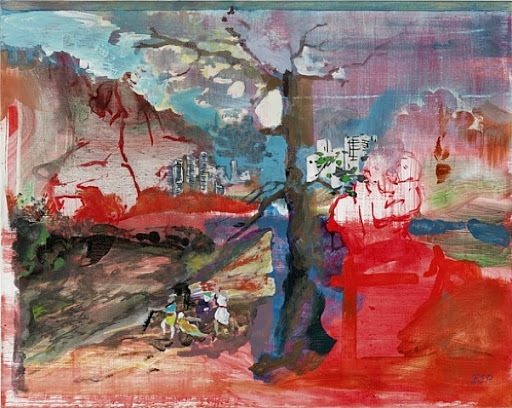 Flat planes of colour suggest rather than describe the environment.